"Leliana and Morrigan shouldn't be tradeable"
OK, let's talk about Dragon Age. Dragon Age III was announced and previewed some weeks ago by Bioware staff. Dragon Age II was, well, what it were, and Dragon Age Origins is one of the favorite games ever of this me your humble reviewer. Furthermore, EA thought it was a good idea to disembark Dragon Age franchise onto mobile shores with a collectible card game. Oops. Yes, you've read it right: we are not talking about a gritty moonlit dungeon crawler, or an adventure game with witty dialogues and charismatic characters either. It's a yet another card game. In fact, it's a yet another high quality with brilliant graphics and animations and backed by a successful franchise, which is even sadder and proves our fear of an oncoming trend of making CCGs of everything. 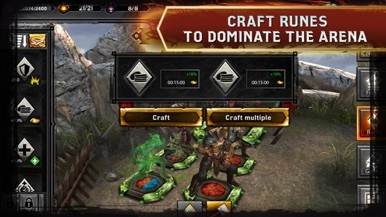 Should we thank EA it's a CCG and not a "Dragon Age Run" or a "Dragon Crush Saga"? Curiously, although design is outstanding, the 3D design doesn't make any favor to this game, which would have looked great in Dragon Age's comic style. One would think that, as characters are in 3D you would be able to customize them, which would be a great improvement to the genre, but you can't. Likewise, no matter how good it may be to look at, it can heavy and deeply disappoint Dragon Age fans. Oriented to fans of the CCG looking for a high quality game. Fans of Dragon Age, come back home: the Blight of CCGing has reached these lands. COLLECT THE HEROES. BECOME A LEGEND! 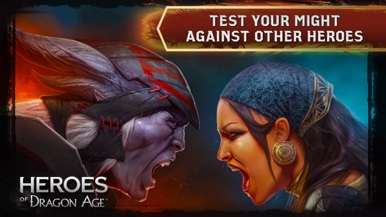 Build a party of famous warriors and epic monsters from Dragon Age lore. Battle other players in strategic, CCG-inspired 3D combat and compete for daily PvE rewards in the Nexus. Fight bosses on engaging quests from the award-wining, dark fantasy RPG games. Collect hundreds of characters from the Dragon Age universe, including rare dragons, giant golems, and other devastating creatures – each with unique abilities, stats, and factions. 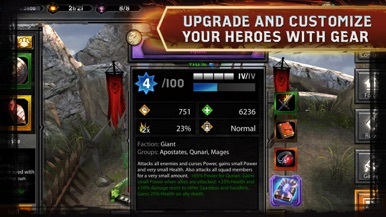 Unlock Fortify Slots to consume your other heroes’ stats and become more powerful than you can imagine. Devise deep strategies with the Gallery: a compendium of hero groups, faction, rarities, and specialties. Welcome to a quest-embarking, boss-battling, PvE adventure for all skill levels. Progress through exclusive maps and complete daily challenges to win heroic loot! Build up to eight squads and watch your strategy unfold on the battlefield. The more heroes you collect, the more possibilities you have at your fingertips. Clash against other players to earn banners and one-of-a-kind rewards in timed events. Deploy your winning formations to earn trophies and dominate tiered leaderboards. Can you beat other players and hold the top spot? Play through epic quests and boss battles as you immerse yourself in Dragon Age lore. Earn achievement rewards by reliving places, times and storylines straight from the beloved franchise! Visit: https://help.ea.com/ for assistance or inquiries. 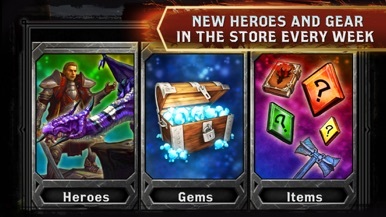 Everything in Heroes of Dragon Age is attainable for free; however, some game items can also be purchased for real money. 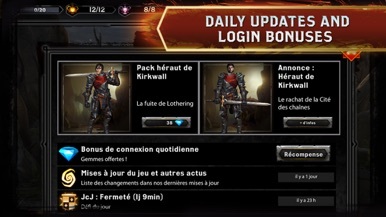 If you don’t want to use this feature, please disable in-app purchases in your device’s settings. This game is not supported on iPod touch® 4th Generation. Real Racing 3 is one of the most anticipated car racing simulator for iOS. Real Racing 3 is bursting into scene. After months getting trailers and scoops, it has finally hit our mobile devices. Let's see if the wait and expectations generated were well-worth. I would bet no one's is complaining about RR3's graphics, at least, if comparing to what's….